(NewsUSA) - Women have been told to get a mammogram every year starting at age 40. Why? What are the downsides to getting checked - or not - each year for breast cancer? The American College of Radiology (ACR) and the Society of Breast Imaging recommend that women get a mammogram each year starting at 40. This will save the most lives. The ACR says women should have a risk assessment by age 30 to see if screening earlier than age 40 is needed. According to National Cancer Institute records, since mammography became widespread in the 1980s, breast cancer deaths in women are down more than 40 percent. Some say that's due to improved treatment. Yet the breast cancer death rate in men - who are not screened but receive the same treatments as women - has not improved. So better treatment alone is not enough. Some organizations say to wait until age 45 or 50 to start mammograms and then do them every other year. One reason given is "false positives." When doctors see something on a mammogram that doesn't look right, they ask the woman to have another mammogram or ultrasound exam to take a closer look. If that test finds nothing wrong, some call the result of the first test a "false positive." This happens in about 10 percent of women who get a mammogram. For about two percent of women tested, the second scan can't rule out a problem, and they may get a needle biopsy. Less than half of the women who get a biopsy will have cancer (see graphic). Others say that mammograms find cancers that won't ultimately kill you. They call this "overdiagnosis." Studies based on actual women who get tested show that this is rare - perhaps a tiny percentage of cancer are found. Doctors can't tell which cancers will quickly kill and which won't. The only way to know is to not treat your cancer and see what happens - a serious risk. Starting mammograms later, or doing them less often, won't reduce "overdiagnosis." A truly overdiagnosed cancer would just be found on the next test. Doctors and women would still have to decide how to treat it. And because nearly all cancers can kill, a delay will give invasive cancer time to get worse. 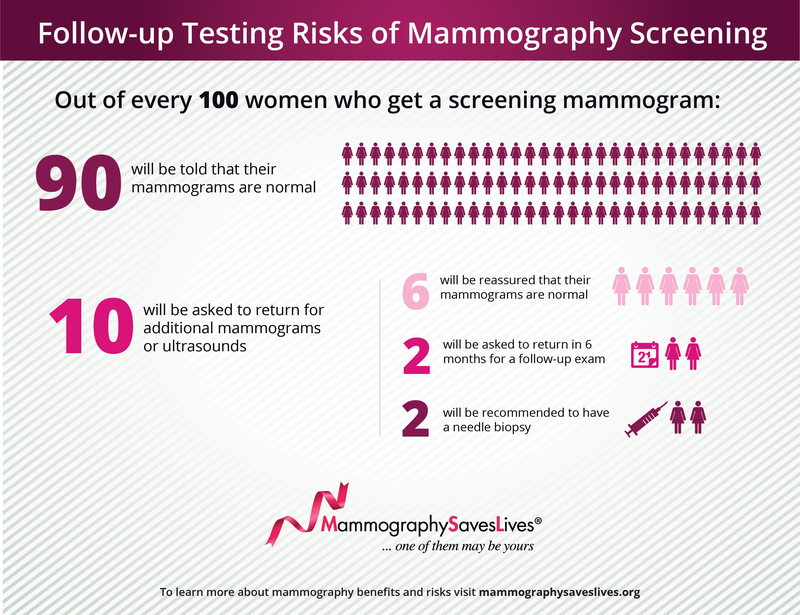 Most experts agree that more women would die from breast cancer by moving away from routine annual screening starting at age 40. One published study says that that number could be as high as 13,000 more breast cancer deaths each year. Ultimately, women 40 and older should discuss with their doctors the benefits and risks of getting - and not getting - a yearly mammogram. The websites below can help: MammographySavesLives.org and RadiologyInfo.org.